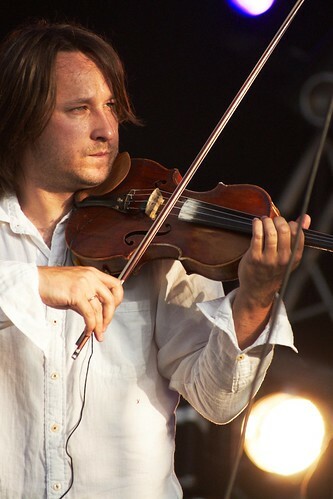 Alexey Aygi is a violinist and a composer based in Moscow. He's known to be a member of a musical group called Ensemble 4'33 and wrote a lot of film music. He was scheduled to play in Japan in mid March but it didn't happen for the reasons we all know. His playing is so fierce and explosive as you could see it from the video clips as follows. With him, the first Moscow concert of Hikashu will surely a great one. Club Jazz Byobu, "the smallest jazz venue in the world" operated only at Jazz Art Sengawa, are mainly placed outside during daytime. After the dusk comes, the byobu would be moved inside the Sengawa Theatre and opened for musicians. The video quoted here is recorded on July 11, 2010 - the last day of the year's festival. The musicians, including Mita Freeman and Shimizu Kazuto from Hikashu, were jamming and amused themselves. Club Jazz Byobu continues this year. Experience the intimacy with musicians, and nice acoustics of the space. It has been known that Jazz Art Sengawa features literary figures in its program. The tradition continues this year: Jazz Art Sengawa 2011 has a reading of Shiraishi Kazuko. Simply put, she is one of leading poet in Japan. Her work is renowned outside the country and many of her pieces are translated in English and other languages. She is also known to be deeply connected in jazz. She wrote about the music many times and performed with jazz musicians in public. Recently turned 80, she is alive and kicking. Her voice is strong, her presence is so huge, and her reading is eloquent and imaginative. Don't miss the opportunity. Just come to Jazz Art Sengawa this friday and listen to Shiraishi Kazuko, the Great Dame of Japanese Literature. The video clip of Jazz Art Sengawa 2010 is just surfaced. Right now there is only the video of day one uploaded. We'll post here if the clips of other days are available online. Jazz Art Sengawa 2011 is coming this weekend. See here for information.